Ukrainian President Petro Poroshenko has declared that Russia has invaded his country. The EU and the U.S., however, are in no rush to provide military help to Ukraine, limiting themselves to sanctions against Russia. Meanwhile, Moscow has dismissed the latest Western accusations and satellite images released by NATO as a provocation. On August 28, Ukrainian President Petro Poroshenko announced that Russia had sent its armed forces into Ukrainian territory after Kiev suddenly lost control of the coastal town of Novoazovsk, some way south of the main conflict zone around Donetsk. Ukraine's Permanent Representative to the EU Konstantin Yeliseev has called on the West to give Kiev "substantial military and technical assistance." However, U.S. and EU leaders replied that they still do not intend to go beyond the framework of sanctions against Russia. In the current political situation, Kiev's main objective is to have the U.S. and the EU actively participating in the conflict in Ukraine. As soon as Poroshenko announced Russia's invasion of his country, Ukrainian Foreign Minister Pavel Klimkin wrote on his Twitter page: “Right now the OSCE Permanent Council is in session. We demand the convening of the United Nations Security Council. We are raising everyone." According to one Russian political analyst, one of the motives for Poroshenko's announcement was his forces' recent failure in the clashes with the pro-autonomy militants: The Kiev government lost control of the coastal town of Novoazovsk, and Ukrainian society may hold the country's government responsible. "The president, as Commander-in-Chief, is accountable for military success or failure to society," says Russian political commentator Fyodor Lukyanov. "The weight of responsibility is on his shoulders. Ukraine also finds itself in a very difficult economic situation and, seeing the West's political support, the president also wants to hasten its economic assistance." 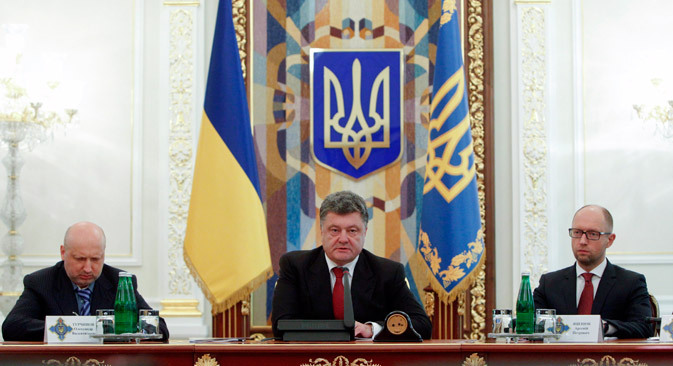 Poroshenko's internal opponents have also increased their political pressure. Prior to the president's announcement about Russia's invasion, Yulia Tymoshenko stated that Moscow had "started a war against Ukraine" and that the president must introduce martial law and establish a "General Headquarters" in Donetsk and Lugansk. "The president must operate all the levers of Ukraine's defense," Tymoshenko urged, demanding an emergency meeting of the Rada (Ukrainian parliament), which "must appeal to the governments and people of the world for real military assistance." After such announcements from Poroshenko's main internal rivals, he had to act very efficiently, Lukyanov believes. "For a country that is going through a period of war such an internal strife is not very proper. On the other hand, Ukrainian politics was never known for its morality," says Lukyanov. In the course of the emergency UN Security Council meeting, Sir Mark Lyall Grant, the UK's Permanent Representative to the UN, stated that the presence of Russian forces in Ukraine "violates the country's sovereignty and contradicts international law." He remarked that London has "irrefutable evidence demonstrating that Russia's regular forces are active in Ukraine." "Russia can no longer pretend that it is not directly involved in the conflict," said Grant. In his words, Moscow has also given the self-proclaimed republics "a substantial amount of advanced weaponry, including tanks, armored personnel carriers and artillery." U.S. Permanent Representative to the UN Samantha Power said that Russian military technology is currently located in the coastal town of Novoazovsk. "In the face of these deeply alarming actions, the most important question for us now is not what we should say to Russia," said Powers. "The most important question is what we should do to make Russia listen." On Thursday NATO published satellite images, which, according to the organization, prove the presence of Russian artillery in Ukraine. In turn, Russia categorically denied all accusations and labeled them just another act of provocation. Russia's Permanent Representative to the UN Vitaly Churkin asked the U.S. to explain "what dozens of American advisors are doing in Ukraine's Council of Defense and Security building." He also asked where the Ukrainian military had obtained "the most recent American weapons systems" and "how many American mercenaries from so-called 'security companies' are fighting thousands of kilometers from their native shores," an apparent reference to unsubstantiated prior claims by Russia that large numbers of U.S. contract soldiers were participating in military operations in Ukraine. Russia’s Defense Ministry, meanwhile, was unequivocal in its response to the publication of the satellite images, arguing that NATO’s credibility was rapidly eroding. “You know, it’s not funny any more. Apparently, the new secretary-general of NATO will soon have to work really hard to restore the badly dented image of the alliance as a solid international organization. I would like to draw everyone's attention to the fact that, where previously similar images were signed by someone: General Philip Breedlove [NATO Supreme Allied Commander in Europe], Anders Fogh Rasmussen [NATO Secretary General] or, at least, Oana Lungescu [NATO Spokesperson], they feel embarrassed to do it now," Russian Defense Ministry Spokesman Major General Igor Konashenkov told Interfax on August 28. "As a result, the phrase ‘NATO has published satellite images of Russia's presence in Ukraine’ has become in the past few months as nominal as the well-known phrase ‘British scientists have found evidence that …’,” said Konashenkov. “I would like to remind everyone that, as a rule, after these words the media give the results of some absurd and absolutely impractical studies. There is simply no point in commenting on all this seriously," he said.